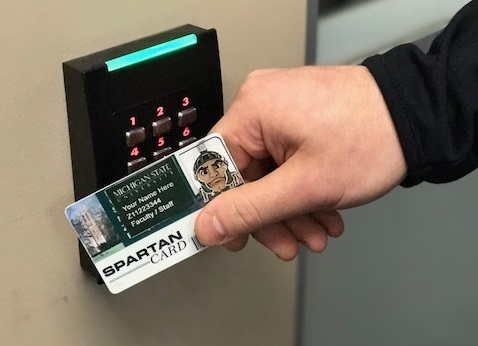 Michigan State University has undertaken the installation of electronic access control in order to provide for a safe and productive work, learning and living environment. The MSU Police, Access Control Unit is responsible for the monitoring, design, implementation, maintenance and operation of the campus wide access control and security system. In 2007, the MSU Police Department, Access Control Unit, along with representatives from the Vice President for Finance and Operations, the Provost, Offices of Radiation, Chemical and Biological Safety, Infrastructure Planning and Facilities, Regulatory Affairs, Facilities Planning, Libraries, Computing and Technology, Land Management, and the Vice President for Research and Graduate Studies developed security requirements for the University. These guidelines apply to the interior spaces of buildings which include the following areas: research and research support; technology server rooms; rooms necessary for the major operations of buildings and other areas that may be categorized as sensitive due to the nature of the information, activity, or equipment stored there. The detailed requirements are available from the Access Control Unit. The requirements are intended to standardize security levels for various functions and provide a safe and secure work and living environment. Construction standards require all new construction and major building renovations to include access control on exterior doors and requires interior doors to be prepared for card access as part of the project costs. The Access Control Unit is involved at initial stages of project design to ensure security requirements are melded into the design of all projects. The Major Administrative Units identify spaces which require enhanced security based on both the security guidelines and their own observations. Along with interior security, a multi-year project is under way to convert exterior access control from metal keys to electronic card access. Entry to the living areas of all residence halls is controlled through the use of card access. This system currently controls access to over 180 buildings and provides 24/7 monitoring of more than 15,000 security and life safety alarms. For efficiency, issue tracking and cost control all maintenance or repair issues are coordinated through the Access Control Unit. We will dispatch repair personnel as soon as possible when a problem is reported. The cost for the repair for the majority of problems is covered by your monitoring fees. If there is a problem with access, the departmental/unit’s building access contact (BAC) should be the first point of contact. BAC can verify that the person is or is not authorized for access into that area. If the card reader lights are on, but it does not beep when you present your card, the card may be defective. Replacement cards are distributed by the MSU ID Office, Room 170 International Center. To get started with electronic access control in your building, the Access Control Unit will coordinate the security evaluation and system installation. A member of the Access Control Unit will meet with you and provide a complete evaluation of your security requirements. The first step is establishing the type of security that is needed for an area. Each security solution is unique for each circumstance, no single solution works for everything. A security assessment involves a tour of your facility, floor or room. We will provide you with feedback and general recommendations on what types of security may be necessary for your facility. A site survey determines the type of equipment necessary for the security goals desired. A comprehensive evaluation of the physical site as well as discussion of your needs for the operation will occur resulting in general hardware requirements like the need for card readers, motion detectors, and cameras. It is important that consideration be given to your work flow as it directs equipment and programming. After the survey a preliminary cost evaluation will be completed by MSU Infrastructure Planning and Facilities. Once a decision is made to proceed, a timeline for installation and expected completion will be provided. These times vary according to the size and scope of the project as well as existing projects already in queue. MSU Infrastructure Planning and Facilities will install conduit and electrical cable and all necessary hardware for the access system. In the case of a major renovation or new construction, an outside contractor may be used to some extent. All access control equipment (card readers, controllers, etc.) will be installed by MSU Infrastructure Planning and Facilities (IPF) and the system tested and commissioned by Siemens. During the installation phase, an authorized building contact must be appointed. Each unit should consider appointing two people depending upon the size of the department. The authorized contacts are responsible for authorizing access for individuals to specific doors, establishing time schedules for the doors and maintaining the list of authorized users. In the case of multiple departments located in a building, time schedules will be determined by involving all established contacts. Please use the Authorization for Building Access Contact to submit the appointees. Once the authorized contacts have been appointed, identification of the users (authorized personnel lists) and access to specific doors and time schedules can be established. The expectation is that this part of the process will occur concurrently with the installation of equipment. Once the equipment has been installed and tested, user training can be done and the system placed into operation.